Loved by all: Family, relatives and friends bade farewell to Teo at her funeral service on Thursday. YONG PENG: Throughout her life, Teo Guat Kwee had reached out to help churches, schools and the underprivileged. And on her death, her children did the same. They gave away the contributions collected at Teo’s funeral to charity. A total of RM5,000 was donated to the Yong Peng High School to help poor students, while the remaining RM2,000 was donated to various churches, charity organisations, Chinese schools and associations. “Everyone is equal and deserves the same love, respect and grace,” was the motto of Teo, 89, who came to Malaya from China with her brother Chang Ming Zoo in 1932. Teo died on Sunday. 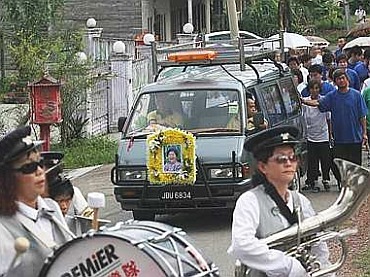 On Thursday, the 80-year-old Chang, Teo’s 11 children, 50 grandchildren and 17 great-grandchildren were joined by dozens of friends and relatives, bade farewell to her. “She loved to help people and has never turned anyone away,” said her son-in-law Low Ah Tee. Low said Teo had changed his perception on equality between man and women. “I was born in a traditional family where men are given a higher status than the women. “But after meeting my mother-in-law, I totally agreed with her that both are equal and should be treated the same,” said the 64-year-old retired teacher. Teo’s daughter Wong Ee Teng said her mother had very strong determination and faith. “When she was sick, she told herself that she would be well because she did not want to burden others,” she said. She said her mother was a rubber tapper until she was 65 to support her family, as her father Wong Pang Say had asthma and was unable to work. “She made sure the 12 of us got the best in education and others,” she said. She added that among her siblings were a London-based IT consultant, retired teacher, tutor and nurse. Wong Pang Say died in 1980, while Teo's eldest son died in 2002. Teo was buried at the Yong Peng Christian Cemetery.